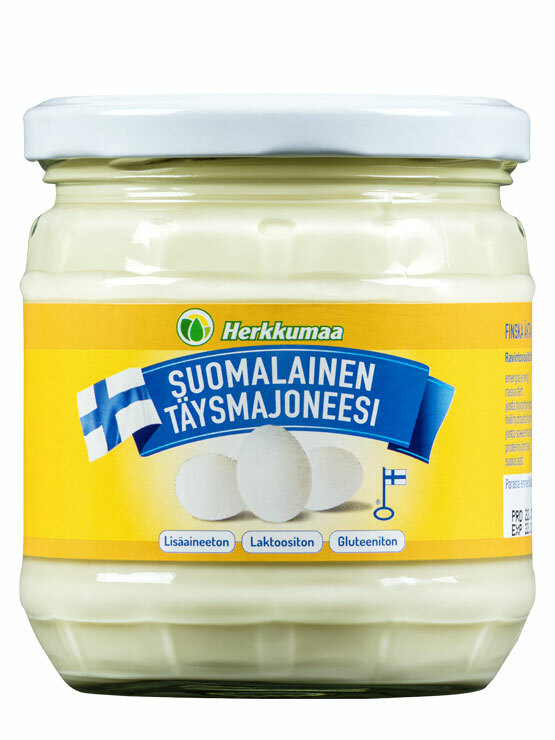 There’s a reason why Herkkumaa’s real mayonnaise is praised as the best in Finland: on the basis of its ingredients, it is also the purest. Our real mayonnaise is made with Finnish free-range eggs and rapeseed oil at our Hämeenlinna factory. It is completely preservative, lactose, and gluten free. The chickens are fed GMO-free fodder, and the ingredients used in production can be tracked all the way to the henhouse. The eggs are proven salmonella free, so in addition to being delicious, the mayonnaise is also safe. This rich mayonnaise adds the crowning touch to burgers, barbecued delicacies, and salads. Package size 380 g.
Ainesosat Rapeseed oil / canola oil (Finland), water, egg yolk 6 % (Finland), sugar, wine vinegar, salt, mustard seed.